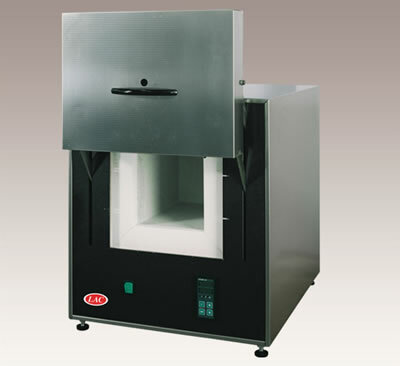 LMH furnaces are used for a wide range of laboratory tests in medical, dental, hygienic, ceramic and glass labs, and also in other industries. They are very suitable for testing in which a very precise distribution of temperature at DIN 17052-1 is needed and also where quick heating to the desired temperature is required. Applications include material heat treatments, fritting tests, calcinations, softening or material sintering point setting and the firing of samples. The LMH standard design includes a door opening upwards, closed ceramic muffle, S thermocouple, HT40A controller and cooling ventilator. Optional accessories include rotary table, exhaust fan, graphic temperature recorder, RS interface, temperature cycle recording software, INDUSTRY controller and inlet of protective atmosphere. Benefits of the LMH line include a reduced jacket temperature, no contact between charge and heating spirals, dynamic temperature curve regulation, and low power consumption.